Unfortunately, this Winter season had been one of the driest that we could remember so we doubted there would be any worthwhile waterfalls to try to reach. In fact, I had been planning for a Summer road trip with the family this year to the northernmost sections of California, but that might have to be put on hold at least through this year given the low precipitation. On top of this uncontrollable factor, I just gotten over a bout of food poisoning that produced some chills and headaches yesterday while at work. So the cards were pretty much stacked against us as we were busy tending to Tahia’s morning meal and diaper – a ritual that takes on average a couple of hours from wake-up to her morning nap at around 9-ish. This alone would already give us a late start to the day, which meant we’d have to deal with crowds, the unseasonably warm weather, parking, traffic, you name it. 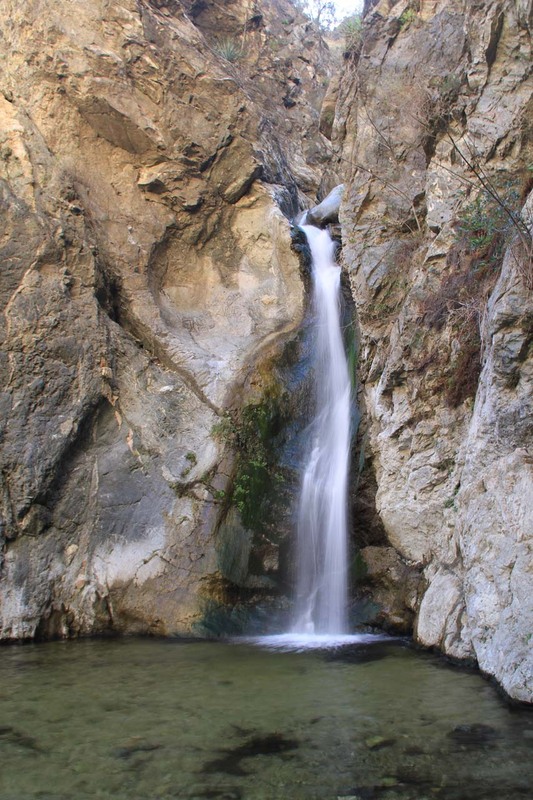 Anyways, Julie was determined for us to go on a hike today despite the inertia, and she finally decided that we should go ahead do Eaton Canyon Falls again. After all, Tahia hadn’t seen it plus there’s a good chance that this one would still be flowing given that a couple of years ago, the waterfall was still flowing despite drought conditions and the aftermath of the Station Fire. So with the mental exercise out of the way, we trudged forward as we left the house at 10am. Tahia didn’t take her nap so now we hoped that she would at least get some rest during the drive up to Altadena. 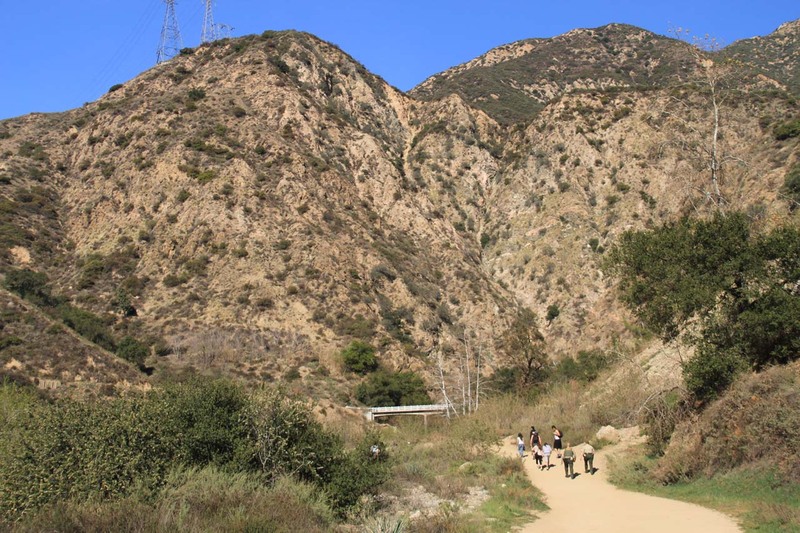 When we were headed west on the 210 Freeway, we overshot the exit we were supposed to take thinking that we should be looking for Altadena Drive. Apparently, we should’ve exited at Sierra Madre Ave since the Altadena Dr offramp sign was only visible heading east on the 210. 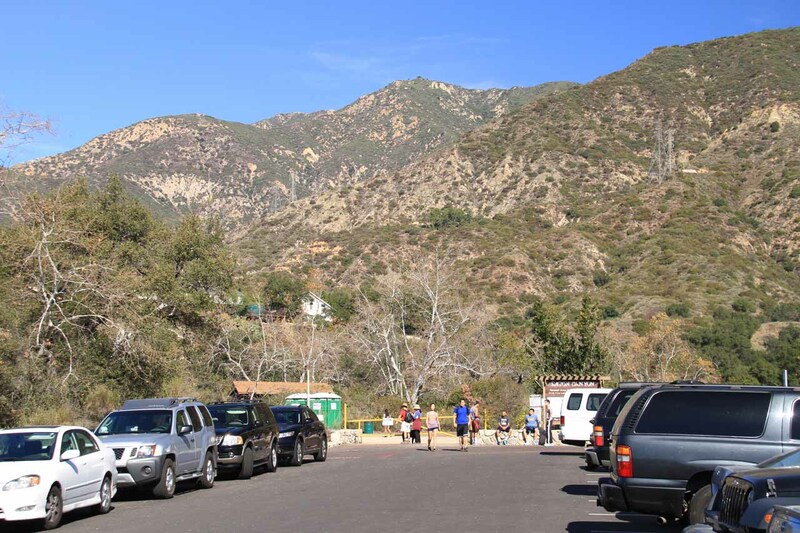 Anyways, this little detour only costed us a few minutes (though it bought Tahia a few more minutes of nap time), and eventually we made it to the familiar car park for the Eaton Canyon Park. As expected, it was very busy with the parking lot completely full. But as we made a three-point turn at the trailhead and were about to head back out for street parking, we got lucky with a couple of women getting into a car and vacating their spot. I’m sure that saved us a few paces knowing that we’d be carrying Tahia on this minimum of 3 miles round-trip hike. So we parked the car at 10:45am, but it took a while to pack a small picnic of fruits in my pack along with Tahia’s munchies and milk for the trail. Because Tahia started to drink conventional milk instead of formula, we had to bring mini-coolers which really added weight and bulked up the day pack. We were also struggling with figuring out whether to carry Tahia on the front or the back and whether it was Julie or I who would provide her the transport. Eventually, Julie determined that the day pack would be heavier than Tahia so we spent a few more minutes getting Julie all strapped up with Tahia on her back. All this time, there were cars moving back and forth around us thinking that maybe we were about to vacate this parking spot. In any case, we finally hit the trail at 11:15am. 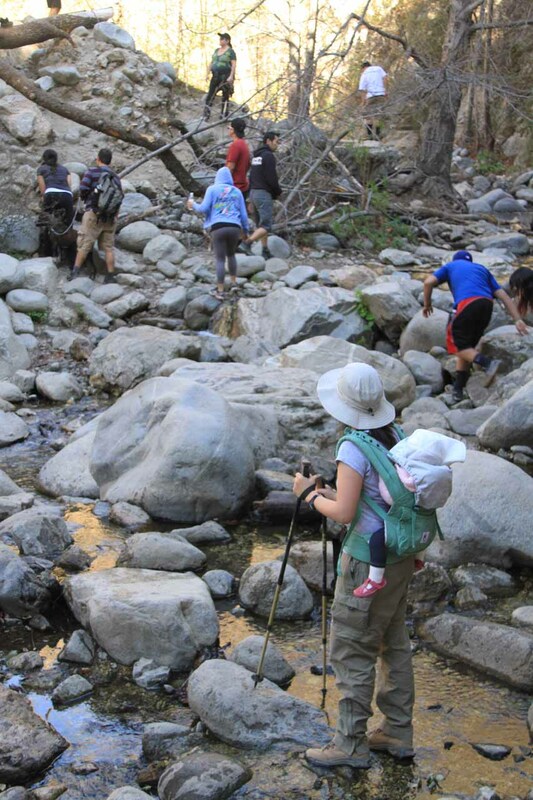 It was once again a reminder of how much slower things get when you bring a baby out into Nature. So we followed the trail of hikers and trail runners going both to and from the falls. The crowd was reminiscent of the Yosemite Valley and Happy Isles trails and nature walks where you easily get thousands to tens of thousands of people each day (maybe even more on weekends). 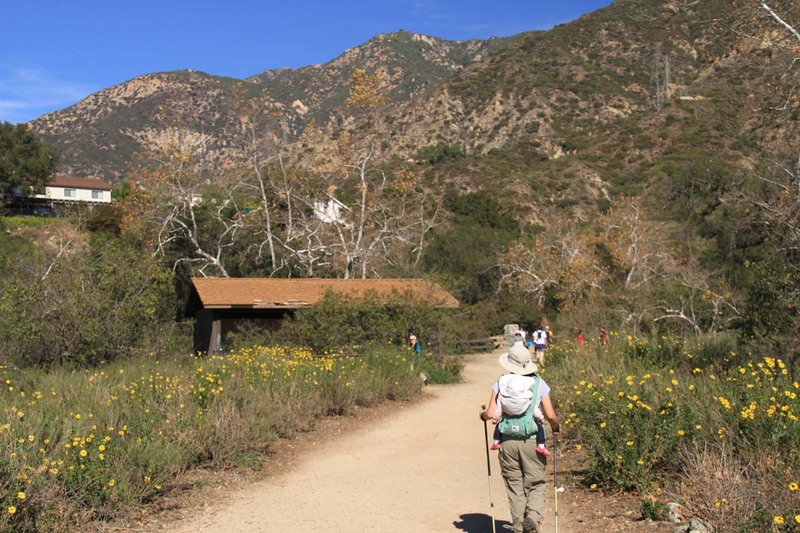 Perhaps even more alarming was the blooming of wildflowers flanking the trail. Wildflowers? In early February? Really? As much as most Americans are in denial about Climate Change (and their role in it), you can’t argue with the evidence you get firsthand. Forget what the media or word-of-mouth tries to convince you. Just get out there and see it for yourself! Anyways, after crossing the wash and following the trail north flanking the wash, we would cross the junction with Coyote Canyon when Julie made the realization that we didn’t bring Tahia’s diapers. So with our already late start, Julie asked that I go back to the car and grab her diapers. I suggested to her that she wait for me in the shade while trying to feed Tahia milk – always a challenging task since she’s not the biggest fan of milk (she’s a very picky eater to begin with anyways). It was about 11:30am when I headed back to the car. But when Julie grabbed the milk and mini-cooler out of my pack, she neglected to close the pack so the whole time I was walking with an open pack. Turned out that one of the water bottles fell and spilled about half its contents. Fortunately, we had another stainless steel bottle with pretty cool water for this very dry and warm, sunny day. 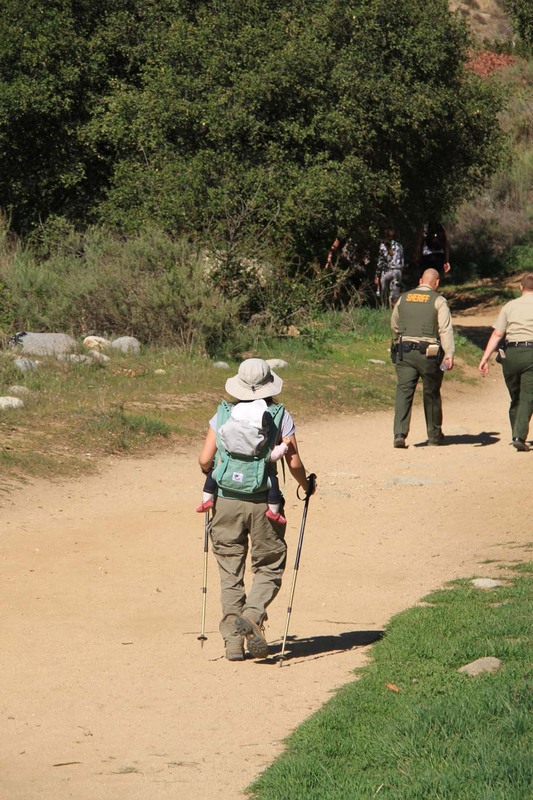 I noticed a couple of sheriffs at the trailhead who then promptly disappeared when I headed back onto the trail. I don’t know what it is about cops but there always seemed to be a sense of being uptight whenever they’re around. Perhaps it doesn’t help that people were staring at them though the cops were doing likewise. 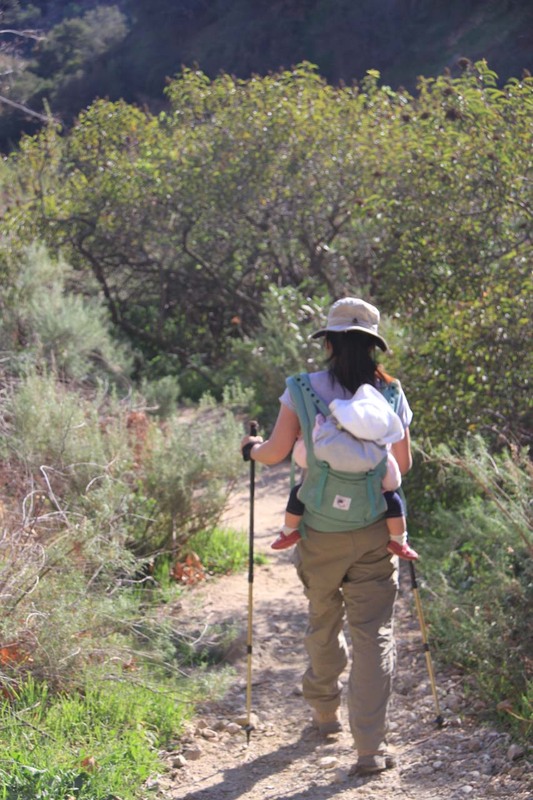 Once I got the diapers and change pad, I headed back onto the trail. I didn’t see the cops anymore, but my foremost thought at this point was to rejoin Julie and Tahia and hoping we’d make it to the falls before it got too late in the afternoon. We were hoping for having King Taco after the hike, but this was looking less and less likely given the unforeseen delays that were adding up. It was about noon when I returned to Julie and Tahia. Unfortunately, I saw Tahia’s sippy cup still had at least close to 5 ounces of milk. Clearly, she didn’t feel like drinking and I was pretty sure that she was distracted by all the human traffic. We decided that we wouldn’t change Tahia’s diaper until we got to the falls. Little did we know how long it would before that happened. Anyways, after a few more minutes of walking while trying to use Tahia’s floppy hat to shield her from the intense sun, we saw those familiar pair of cops with a group of hikers (some of them had dogs on a leash). As we got closer, it looked like someone was getting a citation. And when a cop handed a lady a slip that prompted her to say, “Oh my gosh!” (probably a reaction to the fine), we knew it wasn’t cheap. Julie and I weren’t sure what they did wrong considering other folks also had dogs on a leash but all we could do was speculate. As we pushed forwards, we’d eventually get to the familiar bridge at the mouth of the canyon. The whole time we were walking, we noticed some folks on a different trail across the wash beneath some precariously positioned homes right at the precipice of the banks of the wide wash. We wondered if these homes might get in trouble during flood years, and I guess it’s just one of those things we tend to notice with each time we go out on hikes in Nature. Anyways, the cops caught up to us and then passed us. Apparently, we mindlessly followed the cops towards the bridge. I knew there was something wrong when it seemed like we were going uphill instead of going beneath the bridge. That’s what happens when you don’t concentrate. So after making this little correction, we went beneath the graffiti-covered bridge and then got into the much shadier and cooler canyon. Given the intense rays from the sun aided by the Santa Ana conditions, this change in scenery was much-needed relief. 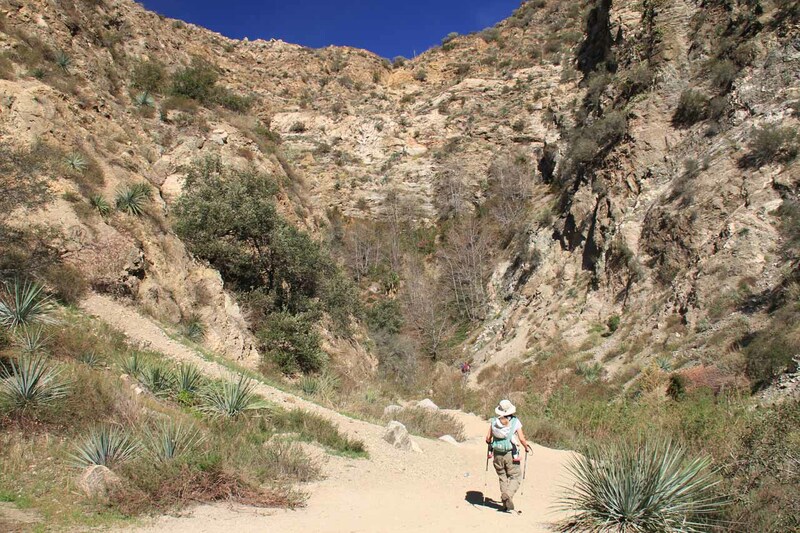 Plus her head was swiveling as she was trying to make sense of the unusual surroundings (for her, I’m sure) composed of steep rocky walls, some desert-like vegetation, and boulders and rocks along with the flowing stream. Speaking of which, our confidence that we would be seeing a waterfall today was much higher when we knew there was a fair bit of water in the stream (which we had to cross at least a half-dozen times I think). 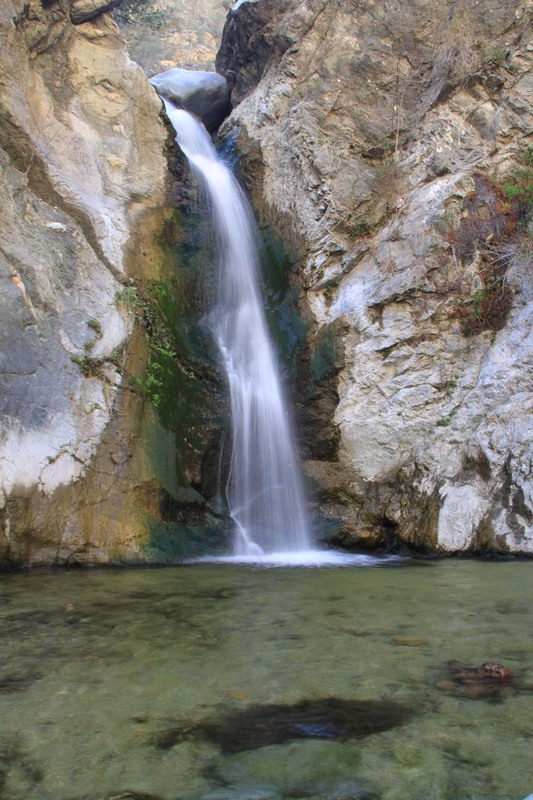 Clearly, this waterfall was turning out to be the old reliable that I had hoped it would be. Too bad the rest of Southern California’s waterfalls probably wouldn’t fare as well on this dessicating Winter (what Winter?) season. It’s funny how much we took for granted when it was just Julie and I because now we noticed every little scramble and detour. There were no shortage of them on this hike, but at least none of them turned us back. 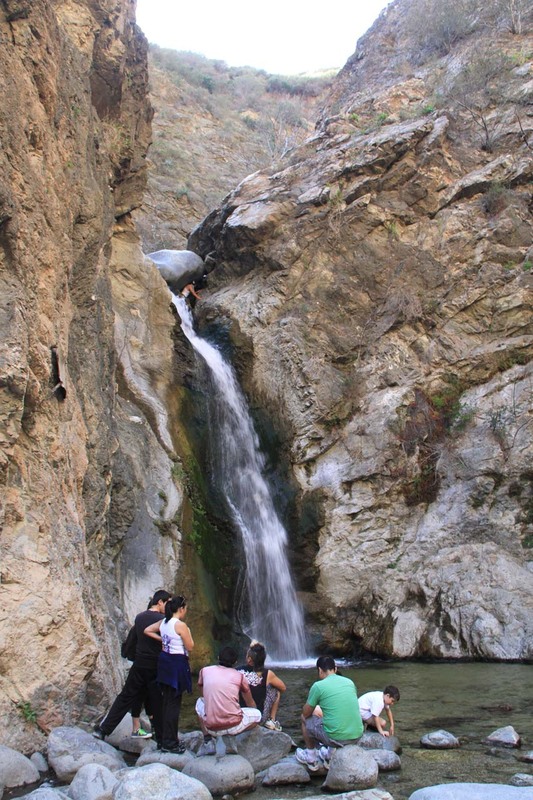 Eventually at around 1pm, we finally made it to the busy yet familiar sight and sounds of Eaton Canyon Falls. Now that we could confirm it was flowing well despite a dry Winter, we could confidently say this is indeed a year-round waterfall. With our packs unslung and Julie trying to feed Tahia the milk she wasn’t fond of drinking, we were moving so much anymore. But at the same time, it definitely felt much cooler (almost chilly) as our sweat was evaporating within the canyon breezes. I went ahead a took the time to take the familiar photos and movies around the falls. However, this also gave me time to notice there were some hikers who managed to make it to the top of the falls as well as some painter in one corner trying to capture the scene the old-fashioned way. 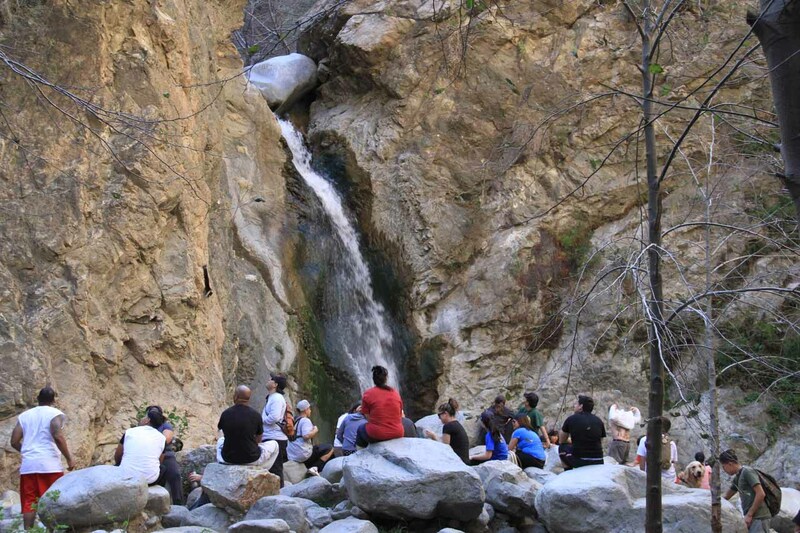 In between all this, there were easily hundreds of people in the bouldery amphitheater area at the base of the falls. Given the diversity of people that were here from Asians, Latinos, Caucasians, African-Americans, and even some Indians, it made me feel good that the Lakers weren’t the only thing that could bring together people of all different backgrounds into one place in a peaceful manner. I guess that was my silver lining to the crowds, the traces of graffiti, and a little bit of litter which happens when you get this many people. So once I was done with my obligatory photos and movies, I rejoined Tahia and Julie where I could see that Tahia still didn’t really want her milk. Julie did give Tahia some bananas, which she was actually biting right off from the banana peel itself, which was a bit of an unusual sight for me. And now that I was here to help free up Julie’s hands to do other things, we eventually gave her kiwis, avocados, meatballs, and eggs. Then, we had to change her diaper in perhaps the most uncomfortable settings yet as she would constantly try to flip herself onto the dirt while trying to touch the rocks around her (then try to put those hands in her mouth). Nonetheless despite her complaining, we eventually changed her diaper and tried to feed her for as long as possible before we posed for a few more photos to prove we were here and then headed back out. By this time, it was about 2:30pm. There was a brief moment of slightly fewer people in the amphitheater but then we left just as the next wave of people showed up. The hike out was mostly uneventful, and we eventually returned to the trailhead at around 3:15pm. We were debating whether to head a little east towards Old Town Pasadena to satisfy our King Taco craving, but Julie had to be at a friend’s birthday party later this afternoon so we decided to pass on it. So we eventually got back home at around 4:15pm. I think Tahia ended up getting most of her nap on the hike back out as she was busy drinking whatever milk was still in the sippy cup on the drive home. So I don’t think she had a good nap all day today and she must’ve been overtired. It still took some time before Tahia finally had her afternoon nap (which occurred some time shortly after 5pm), but I figured this disruption in her schedule was a small price to pay for the out-of-the-box experience. Sure taking Tahia places goes against convention as it’s full of inconveniences and unforeseen delays, but with each of these excursions, we’re learning more about what we can and can’t get away with. Ultimately, we hope to parlay these experiences with a major trip this year that goes for longer than a couple of weeks – just like old times. And given the drought we’re about to have (let alone most of the US) this year, we mind as well go where the action is – somewhere overseas.